I can never say Infragistics right, but they produce top notch controls for the ASP.NET world. 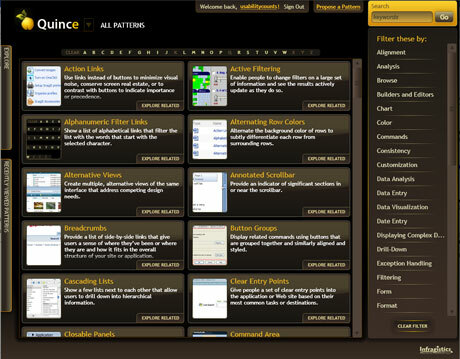 Now they have something else that is way cool: Quince, a great little directory of user interface patterns that is built using SilverLight. J. Ambrose Little, a User Experience guy over there, wrote an extensive blog post about the new tool. You can navigate through different patterns four different ways (I find user tasks especially useful), search them via keyword, and sort through them by letter. Very, very easy to use. The best part? If you have a design pattern you want to submit, you can do it through the site, and the Infragistics team will review it and post it. It’s got all the requisite social networking tools with it!